These Las Vegas print advertisements always make me smile. I posted about one previously here. The winning formula includes sophisticated homos with the presence of ridiculous heteros. 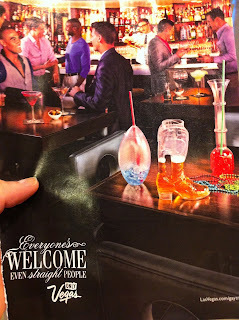 If you go to Las Vegas you will see many heteros confusing Las Vegas with New Orleans during Mardi Gras because they have crazy drinks and beads. Of course, homos understand the concept of time and place. Everyone's Welcome, EVEN straight people!